Bookmark these bars in Hauz Khas Village for one of those low-key evenings when you want to catch up with some friends over a couple of drinks and minimal ambient noise. If you need the drinks, dinner and ambiance trifecta, this is the place to be. This chaos-free bar has live music, dim lighting, all-wood interiors and a great bar – not to mention awesome Italian food. Go for their peri peri chicken pizza, butter chicken risotto or the masala paneer bhurji tart. They also have a Chuski Bar on the menu, which you’ve got to try (our favourite is the LIIT with Kala Khatta). Overlooking the Hauz Khas fort and the pretty greenery surrounding it, this place has wooden seating and pops of teal spanning its three floors. It’s perfect for chatting over a few sangrias and refreshing cocktails. Their European menu is full of salads, soups, tapas, grills, sliders, pizzas, and is an absolute delight (don’t forget to try the Upside Down Pot Pie pizzas). 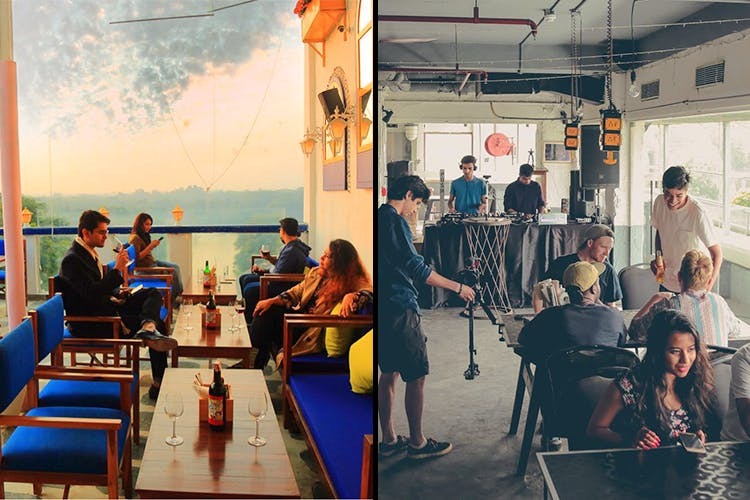 An extension of the popular Hauz Khas Social, this rooftop area has one of the best views in Hauz Khas Village, and a chilled-out vibe, which makes for an evening of fun banter with your BFF. Try their LIIT and butter chicken. With two floors of comfy seating, live music and a stunning, open terrace, the place is divided into sections. So, if your evening scene switches from a sangria date to serious drinking and dancing, this place works for both. Don’t miss out on the Thai Curry Pizza, missal pao, hummus and pita, Green Velvet Cake and chocolate pizza. We also love the well-stocked bar that has everything from shots to killer cocktails and Bira pitchers. We’ve always been in love with this place for its minimal interiors, mellow music and fantastic coastal cuisine (we’re already getting hungry just thinking of their Californian tacos and Malabar Paranthas). Order one of their cocktails for sure – they are well-made and delicious..